Even before the president utters the first words of his carefully crafted 2012 speech, Republicans are sending loud signals that there will be little to applaud. "This year, the president's prospects for hope and change are even smaller," noted Republican National Committee press secretary Kirsten Kukowski. Some of the president's policy proposals that White House aides describe as ambitious will require Congressional approval, and most of those "may be dead on arrival in Congress," Kukowski predicted. But the president's tone is expected to be matched with a call for action. "He rejects the idea that nothing can get done in an election year," Carney insisted. Seizing on the economy as his principal theme, President Obama gave a preview of the speech to supporters in a video released by his re-election campaign. In what he called a "blueprint for an American economy that's built to last," the president said manufacturing, energy, education and values would be the foundation for building an "economy that works for everyone, not just a wealthy few." These proposals come after months of deliberations behind the scenes. The President held a conference call with state legislators, mayors and tribal leaders last week "to hear their ideas about the state of the union," a senior administration official told CNN. Through draft after draft, top aides have described the president as "very engaged" in the process. He worked with chief speechwriter Jon Favreau and others on his policy team to "refine it." Tweaks will continue until delivery. Looking to draw in viewers beyond the traditional television networks, the White House will host an interactive live-streamed version of the speech on its website. Senior administration officials are expected to take part in a post-address discussion that will include a live audience and questions from Twitter, Facebook and Google. Another sales pitch will involve the president himself when he hits the road starting Wednesday with a three-day, five-state tour. 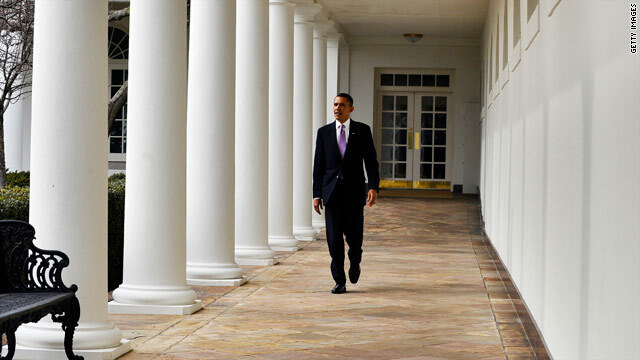 He'll tackle one of the main pillars laid out in his address each day, according to a senior administration official. On Wednesday it will be manufacturing; Thursday, energy and energy security, and Friday, American skills and innovation. Republicans consider the highly touted tour a tax-funded campaign trip, with convenient visits to states that could be key to the president's re-election efforts. "Obama's speech won't be as important for the policy agenda he lays out...as for the political campaign it sets for the next nine months," the RNC's Kukowski said. "Perhaps that's why he will travel to Iowa, Arizona, Nevada, Colorado and Michigan, all potentially swing states in the election." The White House brushes aside that criticism and redirects attention to the president's primary goal of fixing the economy and creating jobs. Top aides insist that despite predictions of more gridlock, there's no reason proposals that will be detailed in the State of the Union address can't find bipartisan support. And while some of last year's promises went unmet, tonight's address will be no less ambitious. "You shouldn't trim your sails because of that," Carney said. LOL campaign speech FTW...hahahhaha...a true leader can get anyone to work together and follow them, an idealist can get their own party to go against them. What country do you live in.It's not the U.S.A. The Republicans have started a class war they can not win. We are the 99% and we will vote the Republicans out in 2012. Genius, using a class centric (and statistically inaccurate) leftist slogan to criticize Republicans for antagonizing class warfare. Simply brilliant. Bravo sire, thou hast opened mine eyes and I hath seen the light. Oh Howard...you are never one to let facts get in the way. Make up your own numbers to believe what you will. If you want to lie to yourself we allow that. If you want to think the George W Bush was the best, isn't it odd that the country wanted him out of office immediately after the election. Bush did not create 1 job for the country only his. He created a military with more that 30000 disabled and 4000 dead over a lie he believed from one man, himself. It's amazing how inaccurate your "facts" are. I would rather read the transcript for myself than lend credence to the dog and pony show of the Left and Right standing or sitting based on partisan preferences. Neither party respects the opposition. I think the President is a good man, I just happen to disagree with his underlying premise that addressing our problems always begins with government action. For all the president's constant detractors (critics), please, instead of the usual Faux News Bumper sticker noise, tell us which Republican Clown should we choose instead? How Much You Wanna bet these guys Just revert to insulting the president....How about $10,000 ????? as R-Money would say. Again, we know you don't like the president and you don't like facts. Seldom do people of limited thinking ability prefer a person that actually uses a thoughtful/smart approach. I think the country has learned its lesson after being Bush-Whacked for 8 years...what a mess. As I said before Obama was elected in 2008, Let's Hire the Smart Guy America. I agree. I'm also tired of being labeled. I maybe registered to a party but that doesn't mean I have to vote for that party just to make a good President a "one term President". If people would do their homework and learn 4th grade politics then they would know the truth. I believe some people just love to hate just to hate. signed: Republican voting straight Democratic ticket in 2012... I did my homework!! You did your homework, and still voting straight democrat ticker? Really? Tell me, 10 months after the dems took majority control of congress during the Bush term, where was unemployment and the stock market, along with the 4 years prior? After 10 months the dems started to implement there ideas and policies. What started to happen? We then elected a democrate President and a democrat super majority in congress. Over the next two years, what happened to unemployment, housing forclosures, etc.? That was a full four years of democrat control of the Legislative Branch...you know, the branch that control all spending and passing all bills. What's finally starting to happen over the past 12 months? What changed? There is your homework assignment. I actually think The People do watch and learn, and after 8 years of both houses of congress being controlled by dems, and another year of the Senate controlled by dems, and seeing what happened to unemployement during that time (<5% increasing to 10%, and still 8.5%) are ready for some Change. In the historically unprecedented chance that 0bama does win re-election, look to both the House and Senate to have a republican majority. Over 1000 days without a budget from the Democratic senate doesn't bother you? Fact is white america will not feel guilty this time which equals a sad Nov for barack, great Nov for America.. I Think we should VOTE for a Republican because they are smartera dn wiser. and will actually do what they say! although im an 8th grader i have some ideas that might would help. i VOTE FOR MITT ROMNEY. This is his last SOTU speech! We can see what kind of legacy he wants to leave behind!! Welcome bigots and conspiracy nuts! Obama's performance has been adequate, not stellar and not disasterous. The stimulus did create jobs and turn around the recession, just not in a dramatic fashion. We are better off than we were 4 years ago (Iraq withdrawal, improved employment, increased consumer confidence) but we have a very long way to go. The GOP is the problem – they refuse to offer us anything approaching a legit candidate. I voted for Obama, but I am quite willing to consider other candidates. I have looked at the GOP field, and they are all absolutely nuts (except Huntsman, but he's out). Ron Paul, in particular, is in early dementia. Why won't the GOP offer us a real candidate? Because the real candidates know that the Tea Party will rip them to shreds. So we get the clown show vs a mediocre president. Sorry, I always vote for competence, and Obama's lackluster performance is still significantly better than any of the fools in the current pool. Last time I checked unemployment was actually lower when he took office than it is now. What has this clown accomplished in the last 3 years except to ram ObamaCare down our throats? To further divide our country and start an all out class war. From my part of the world, I sometimes I marvel how Americans think. I got the greatest shock when they elected President George Bush instead of Vice President Al Gore who obviously was more experienced. I hope Americans will allow reason to prevail and not sentiment. It was the same sentiment that lead to the election of President George Bush and plunged the country into two wars and recession. Obama has done very well. He deserves to be re-elected. I would like to see the President pass a budget for the first time in 3 years instead of asking for yet another extension. Over 1,000 days with no budget. This has never been done in our history. For the first 730 days 0bama had super majority of dems in congress. The dems had maority seats in BOTH Houses, with Nancy Pelosi as "leader" (?) in the House of Representatives, and Harry Reid leading (?) the Senate, and yet not budget EVER passed. I do expect more from my leaders, especially when they had full control of the Legislative and Exectuive branches. The the republicians used the filiabuster over and over and over and over. To stop any creating of jobs in this country and basically call the elelction false. And the people voted out the dems, only to find that when the republicians returned to office nothing changed. No budget, lower credit rating, no new jobs, no progress, just lets do the election over and then we will work. The people can now see that you can't work wth a cup that is full, and if they know so much on how to run the country how did we get here? George W Bush a sleep at the wheel while Chaney ran the country. Occupy Wall Street is rigtht, the only jobs Republicians care about is there own. I'm sorry David but you would like to see the President pass a budget? That's Congress' job duh. The President never even signs a budget. It's up to the House and Senate to create and pass budgets. That's NOT up to the Executive Branch. Get a grip on yourself Davey! Presidents don't pass budgets, the congress does that. What are you talking about? Have not been in even one "poli-sci" class. Please take one of those and get back to us with your expectations of the president, and passing budgets. We will all be assured, if actually learned something, you won't be passing out those Faux News Mis-facts. It's your Country. So far after 75 years of Big Social Programs al we have to show for it is a 15.5 Trillion Dollad Debt and Red ink as far as the eye can see. Not to mention High Unemployment and a Slew of other problems. State Governments in the Red with high Budget Woes. You have now had a real good look at Obama. But it's your country. Which way will you go? Your reply reminds my of Einstein. Per Einstein, the definition of insanity is doing the same thing over and over, and expecting a different result. Thye Dems had 4 full years of control of both houses of Congress (with 2 having super marority conrtol AND 0bama as president). During the last year, we have seen things stabilize (although I would not claim "turned the corner" yet). What changed? Well, the Senate is still democrat controlled, but not by the huge majority of the prior 4 years, and the House went back to republican control. Social programs like social security have been very successfull over the past 75 years. In fact, SS was a key factor in our country experiencing a Great Recession rather than a repeat of the Great Depression. The reason for our huge debt is because a GOP majority put their ideology of "lower taxes equate to more fed revenue" to work via the Bush tax cuts. For 100 yrs since the income tax became law Congress has responsibily lowered them in times of peace and raise them in times of war. That pattern was irresponsibly broken in 2001 and 2003. Our huge debt is the result of a failed GOP ideology that has been proven a failure. I will vote for Obama because the ideas he's had have reversed the economic slide. More importantly, his ideas make a heck of lot more sense than the old, tired ideas the GOP is pushing that have been proven to fail. S.S. was, when passed, only a temporary stop gap, and not intended to remain forever. The quick increasing ager portion of the population compared to growth of new tax payers shows it can not be sustained. Add to that OUR Cogress has stolen all the money from S.S. and only replaced with IOUs which earn not componding investment returns, and it is clear that the systme is doomed for failure. In the past 75 years, anyone taking 7.5% of their salary from when thewy started working (lets say 22y/o for the college kids that never worked while in school), and invested it in no risk rates of return investments (money markets), none would need to work at retirement because the can not live on what S.S. pays back. The big Social Programs have been a big sucess? How can anyone call them a sucess with the 15.5 Trillion Dollar National Debt? Today the IMF reports that Europe is on the brink of Bankrupticy. The Conservatives (and Me) expect you to get off your behind and do your own work, not expect Government to do it for you. But keep voting stupid. That is what I expect again. When your job is gone you will only have yourself to blame. I call it the blind leading the blind. means that ALL taxpayers will pay more, and that as a percentage, the greatest increase will be on the poor and middle class. The Bush tax incentive which allowed ALL taxpaying citizens to keep more of their own earned income, provided the biggest change to those of lower and middle class Americans. You may want the "rich" to pay more, but letting the Bush tax incentives expire across the board will hurt everyone. If you go back and study history and FDR, you will learn that, although good intent, looking back at the outcomes his policies financially hurt the poor and minorities the most, and strong out the great depression much longer than it should have been. Mr. Buffet lives in a free country and has the freedom to donate and pay more taxes if he wishes. Obama must suppport a new law allowing those volunteers who would like to pay more taxes or donate their millions to pay the national debt and do not use adbitrarily by the president. Let me remind you kindly Mr. President that during two years of your presidency the congress was democratic in its mayority and you did nothing anyway. Save your word since we not longer believe in your words. That is a myth. The House may have had a democratic majority but the Senate was not filibuster proof and there was no super majority. so? Obama just don't have the ability or resume to lead. He is finished! Personaly I say we need Bill Gates for president. With 0bama having a democrat super majority on congress (democrat control of both houses with a larger enough majority to override the republicans), why did he have to "be creative to get anything accomplished"? All ears. The Senate did not have a filibuster proof super majority of 60 votes. I looked at my choices and trust me he's not the one currently sitting in the White House spending our money. Obama demonizes the rich, while hanging out with Buffett, Immelt, Soros, multimilion dollar actors, atheletes, and celebrities. Funny all my comments are "waiting moderation". There is not one bad word, or even insuation of a bad word. Only questions based on varifiable facts. Hmmmmm? No possible bias at CNN is there? You forgot Botox Pelosi and Alzheimer's Reid. Wow, all my comments and questions based on verifiable facts have been deleted. No one bad word, not even an insinuation of a bad word, but all are gone. NIce to see such unbiased moderation, LOL. Well, at least we know hard factual questions that don't necessarily support the current president and the 4 years of democrat control of both housed of congress will never be posted. Seeing unemployement go from <5% to 10% and remaining above 8% for over 2 years, and home foreclosures continue at record highs, all the while Nancy Pelosi net worth increases by 100% to over $100M. Harry Reid's net wealth increasing substaintially. Yes, many republicans' wealth has increased too, but that's the onlhy people I see talked about on CNN. Hmmmmmmm? No bias here. New Flash for you Mr. President..............Congress is not budging. The only good speech this country would like to hear this evening is that for the good of the country your stepping down now instead of waiting for November to leave office. My guess is tonight speech won't be about Obama's wonderful record it will be all about Class Warfare. My hope is BO's Teleprompter will short circuit tonight so the President has to speak from his heart.................that will never happen. My fellow Americans tonight I want to make you aware that I am the 4th Greatest President to ever live.................right after that I will be throwing a brick through my TV. Great that is one way to shut off Faux! Wes and Dave. Shouldn't you 2 be out on a ledge somewhere? The way you see it, the anticipated Great Depression#2 did happen, the american auto industry is gone,Bin Laden is still alive,you still have millions who can't get health insurance.Exactly where have you guys been?Have you been living in opposite-land? Dave your comments may be waiting moderation but you need to try it out in real life. "All of my initiatives and policies have failed this country. Vote for me again, or it will get much worse." No...really??? ...is that how the putrid GOP/Tea clown of non-thinkers view, 22 months of consistent job growth, when compared to the predecessor administration, which lost 4 million before Obama was even sworn in. You knuckle draggers never let any facts get in the way of your grade school spit ball idiotic comments. Fortunately most of the electorate can actually think, so that means you and those incompetent GOP corporate lap dogs are soon to become extent from all public discourse. And I say good riddens, because its become absolutely intolerable dealing with a group of fruit-loops, that constantly live in fantasy land, making up facts, re-writing history, and remain in a total state of delusion.... I wonder if you people just see which fool sounds more vapid. What's the prize for the most idiotic statement posted on these blogs???? I am just astounded at the illogical reasoning of some conservatives. DON'T RAISE TAXES ON THE "JOB CREATORS". . . HISTORY CHECK: Since the 80's two presidents raised taxes. Reagan then Clinton. There was a job BOOM. Since the 80's one president lowered taxes on the wealthy. Bush. That created a financial meltdown, record profits for corporations while 14.2 million NEW people filed for welfare. A surplus turned into a massive deficit. ETC. Secondly, "Obama is starting class warfare". . .Umm..what do they call it when the wealth gap between regular folks and the top .8% is at it's largest in history? Is that NOT class warfare? It's NOT the politics of envy to question the system. That sentiment is disgusting and really shows what he thinks of anyone who isn't a mega millionaire. What happened to the days when tax breaks went to people who ACTUALLY CREATED JOBS? Now tax breaks are going to people who hide their money in the Cayman Islands and in Investment firms? Making money off of money is VERY different than making money off of "working". I used to agree with even John Mccain on some issues but I've seen him sell his soul just to keep his job. Some republicans are sensible enough to really aid the President and SERVE their country. Unfortunately they've conceded that the word "compromise" is a vulgar term. I'm disgusted. Not by Republican policies and things. I'm disgusted that they want to reinforce policies that HISTORICALLY don't work. Still fighting over Roe V. Wade and doing these poll tax stunts. If they felt the President was so out of touch with the American people why are they bending over backwards to rig the election? Why is that EVERY detail of his domestic policy proposals poll within 55-70% ? Even if you disagree with someone your argument has to be logical and SANE. Just don't dislike someone or their policies just because. Have a brain for God's sake. Don't be SHEEP. This proposal sounds like the proverb,:"training hungry dogs to watch a meat house, really a chinese task force?? This is America, find Americans that speak and read Chinese and is knowledgeable about tade violations to montior trade violations not those whom you expect to squeal on thier native country to protect America's trade policy. Brace yourselves for massive amounts of nocma propaganda, America!